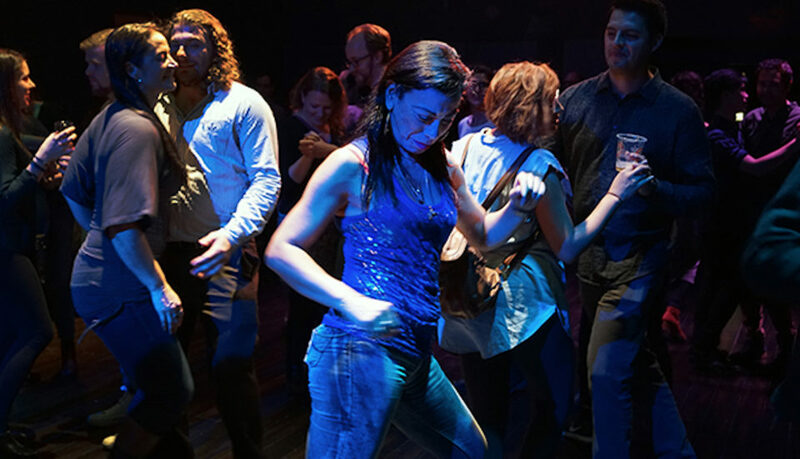 You’ll learn dance moves and a counter-cultural history at this show. Author, actor, director and playwright Carmen Aguirre is bringing her hit show Broken Tailbone to Calgary for three nights as part of the High Performance Rodeo (HPR). Taking place in the Vertigo Theatre Studio, the format of the show is about as untraditional a theatre model as you’d expect at HPR — Aguirre leads a dance lesson of different Latin styles while regaling the audience with tales from her past, a past filled with revolutionary history. Aguirre was raised between Vancouver and Santiago, Chile by revolutionary parents. She credits them with creating the first LatinX dance hall in Canada. If you’re not familiar with the term LatinX, it’s a gender non-specific term used to refer to individuals of Latin origin, essentially a catch all for “Latina” and “Latino,” but with an emphasis on including both non-binary and transgender people. While we’re on the subject of vocabulary, it’s important to note that a dance hall is not simply a place where people dance. It is a place where culture and counter-culture are kept alive. When Aguirre wasn’t in South America where her family was participating in the resistance against Augusto Pinochet, she was with her parents in the dance hall where the plight of people living in exile was ever in focus. It taught her to be a fighter, and that fire hasn’t dimmed in her adulthood one bit. Her show is explicitly left-wing, both in politics — “it’s anti racist, it’s anti-capitalist and anti-imperialist,” she says — and the music chosen. On rare occasions, some audience members have taken issue with this. Around a year and a half ago she brought Broken Tailbone to Los Angeles and was met with angry hecklers. Her take on this? “It was actually quite educational,” she says. The incident only boldened her further and when she met a similar problem with a man who was too drunk for his own good, she had him ejected much to the delight of the audience. Aguirre says women of colour are seriously underrepresented on Canadian stages. A membership census published by the Canadian Actors Equity Association in 2015 stated that 35 per cent of women feel under-represented on stage, while 66 per cent of “racially diverse members” disagree or strongly disagree that Canada’s ethnocultural communities are well represented on stage. Aguirre agrees that High Performance Rodeo actually does a better job of addressing this than many, but says we still have a long way to go. Confrontation is important, but it’s just one side of the coin of Broken Tailbone. It really is a dance lesson and the audience is expected to have fun trying out the moves in real time. Aguirre recognizes that not all audiences gravitate towards mandatory participation, but she says that a welcoming environment is fostered and that getting out of your comfort zone comes with rewards. Ultimately, this show is about risk and reward. The title Broken Tailbone is multi-faceted, but Aguirre says that’s one of the remote risks faced when dancing — it’s also something she’s lived through, which you can only hear about by attending the show. If Aguirre has lived in exile, faced off against hecklers and broken her tailbone, does dancing in front of strangers really sound that scary? Broken Tailbone plays this Thursday, Friday (two shows) and Saturday in the Vertigo Theatre Studio as part of High Performance Rodeo. Tickets and flex passes are available at hprodeo.ca.